Avtar Singh Mauni, from Patiala, Punjab holds the record for the longest turban in the world. The turban's cloth Avtar singh wears alone weighs 30 kgs along with it, he wears decorative ornaments which adds another 15 kgs to it, sums to more than 45 kgs of headgear he carries on his head. Avtar Singh likes to wear purple and orange cloth turban or 'Pagdi' which stretches to as long as 645 metres, when unwrapped - turban could be double the height of Eiffel tower of Paris. Avtar Singh Mauni needs a staggering six hours to don his 'pagdi' (pride and joy). The 645m creation has taken 16 years to assemble and Avtar says he took the length up in stages from 150m to 250m, 365m and finally a shocking 645m. It means the 60 year old holy man is carrying around half a quintal of load on his head every day. 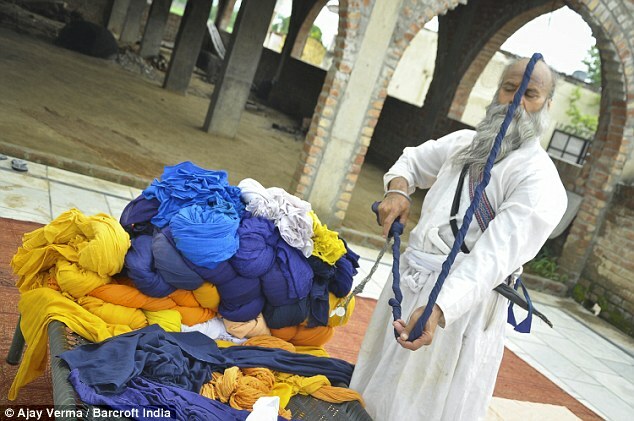 Most other Sikhs wear turbans that measure between 5-7m, but Avtar Singh decided to take it to a whole new level. He just keep putting on the cloth from top to bottom one layer at a time just like one would lay the storeys of a building while wrapping the turban. 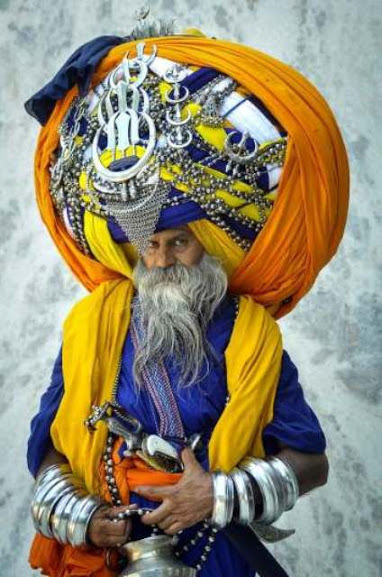 Then he wears some rings which may give support to handle this heavy turban clothes over his head. He also adds many Sikh symbolic ornaments with the turban. He belongs to the prestigious warrior order of Sikhs, known as Nihangs. In full attire, Avtar also carries a sword and heavy bangles, which weigh an additional 40 Kgs. Avtar Singh always rides in a motorcycle on his regular pilgrimages across the Punjab as it may be impossible for him to enter into the cars.